Following in the footsteps of a monumental 2018 model year – one that saw the debut of the 2018 Ford EcoSport and a comprehensive update for the all-new 2018 Ford Expedition – Ford is looking to make its 2019 model year even more impressive. 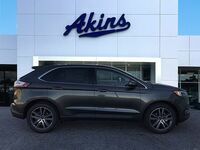 And it all starts with the all-new 2019 Ford Edge lineup, which we have right here at Akins Ford near Atlanta, GA.
And when we say the 2019 Ford Edge lineup is all-new, we mean it. 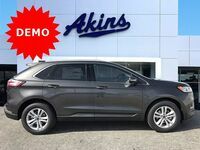 Thanks to its refreshed exterior, its updated interior, its next generation powertrain options, its pair of all-new trim levels, and its newly standard comprehensive suite of advanced new safety, technology, comfort and convenience features, the 2019 Edge lineup has become the new standard-bearer of the SUV class. To prove that point, we put together this 2019 Ford Edge versus 2018 Nissan Murano model comparison. 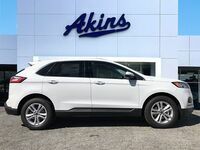 335 HP & 380 lb-ft. Max Power Ratings 260 HP & 240 lb-ft.
As noted in our head-to-head SUV comparison table above, there’s a lot that the 2019 Ford Edge lineup offers that the 2018 Nissan Murano lineup can’t match. 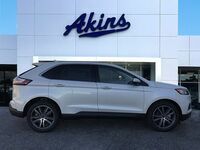 That’s because the 2019 Edge lineup has been fully updated and enhanced for the new model year to include the all-new 2019 Ford Edge ST – the first SUV ever created by the geniuses that make up the Ford Performance Team – and the all-new 2019 Ford Edge Titanium Elite – set to be the most luxurious Ford SUV ever created. You’ll have a hard time if you’re looking for performance or luxury models within the 2018 Murano lineup because they don’t exist. And you’ll continue to have a hard time with the 2019 Murano lineup as there are no plans to include such models for the new model year, either. 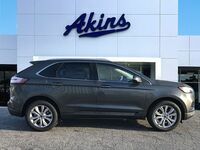 The 2019 Edge lineup also ups the safety ante in a big way by making the all-new first-ever Ford Co-Pilot360 suite of safety and driver assistance features standard on all 2019 Edge models. If you’re looking for similar safety and driver assistance features in your new Murano, you’re going to have to pay more for higher trim levels. 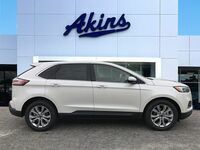 For more on the 2019 Ford Edge lineup, please reach out to our friendly staff here at Akins Ford near Atlanta, GA.